Art Song Canberra is one of Australia’s leading organisations devoted to the regular performance and wide appreciation of classical art song. This special art form — poetry in music — combines the beauty of poetry with the power and delicacy of the voice and piano in duet. Our Season of Song is an annual series of fine vocal recitals by top-class singers and accompanists. The great majority are professionals; many have high reputations nationally and in some cases internationally. Everybody is welcome to our concerts — members and the general public alike. Art Song Canberra offers performing and development opportunities for the amateur and student singer. Art Song Canberra is always pleased to receive expressions of interest from singers of art song seeking to perform for it. Artists are now being considered for inclusion in the Seasons of Song 2020 and 2021. Members of Art Song Canberra help to foster art song in Canberra, take part in soirées and enjoy significant benefits including large discounts on concert prices. Welcome to Art Song Canberra! Art Song Canberra brings together people who enjoy the intimate, exquisite art form of the art song, a type of classical song usually but not always performed with piano accompaniment, using beautiful texts often by great poets. The piano is just as important as the voice, playing a vital role in portraying the meaning of these songs, not only supporting the voice but meticulously setting the mood of the song. The art form originated in Germany and Austria and peaked in importance in the 19th century. Great exponents included the composers Schubert, Schumann, Brahms, Wolf, Richard Strauss and Mahler; the more notable poets included Goethe, Rilke and Heine. While this art form was originally dominated by the German tradition, a similar style developed all over Europe and the USA — in France (the Chanson or Mélodie), Spain, Russia and English-speaking countries. Other composers of this wider variety of songs include Debussy, Fauré, Ravel, Obradors, de Falla, Rachmaninov, Tchaikovsky, Liszt, Tosti, Vaughan Williams, Finzi, Britten, Quilter, Barber and very many others. Art Song Canberra was founded as the A.C.T. Lieder Society in 1976 by a small group of devotees of art song inspired by the visit to Australia in 1975 of the famous bass-baritone, Hans Hotter. 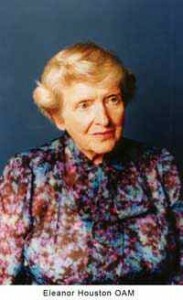 They were led by the late Eleanor Houston OAM of Covent Garden fame. The society’s purpose is to foster and extend the love of art song. It is a dedicated group of volunteers and lovers of art song. It has about 130 members. 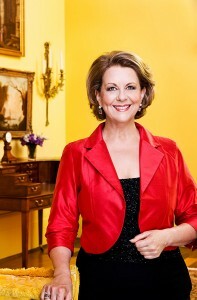 Its Patron is Yvonne Kenny AM. It has established loyal support from the Canberra community and has consistently gained positive reviews for its concerts. It received a Canberra Critics’ Circle Award in 2002 for consistent high-quality programming. Art Song Canberra presents to its members and the general public an annual series of high quality recitals called the Season of Song . These concerts are recorded by radio station ArtSound FM for later broadcast. Art Song Canberra also presents twice annual members’ soirées, in the manner of the earliest Lieder societies and other occasional concerts or events not forming part of the Season of Song. Every year, Art Song Canberra presents a masterclass for singers or duos aiming to specialize in art song. 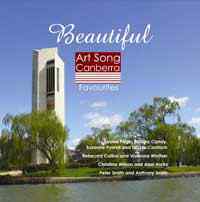 Beautiful – Art Song Canberra Favourites showcases of some of Canberra’s many extremely fine artists including four Canberra Times/City News Artists of the Year. The CD opens with Beautiful by Peter J. Casey, performed by Louise Page, Nicole Canham (clarinet) and Susanne Powell. Louise Page and Phillipa Candy continue with art song by Samuel Barber and others. Rebecca Collins and Vivienne Winther perform French art song by Fauré, Bizet and Massenet and Christina Wilson sings Brahms’ 8 Zigeunerlieder Op.103, accompanied by Alan Hicks. Peter Smith and Anthony Smith conclude the CD with several songs popularised by Peter Dawson. pay by internet transfer (please ring either 02 6286 7373 or 02 6288 7419 or send an email to info@artsongcanberra.org to obtain BSB and Account No.). Please describe the payment as: [your initials and surname] ASC CD.